Try Publishnow.co — the simplest and easiest publishing and blogging platform. We build a content publishing platform to help marketers/writers to streamline content publishing and distribution process. How are we different from Medium? 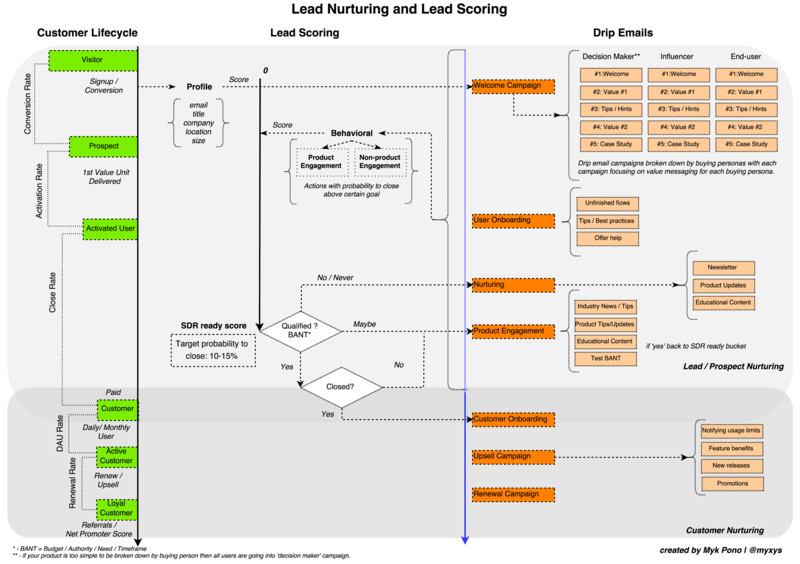 In this guide, I will make an attempt to describe how SaaS/enterprise companies design lead nurturing campaigns and how lead scoring can help prioritize leads and improve conversions, as well as how lead nurturing strategy affects the creation of drip email campaigns. The primary goal of this article is to help you design or improve your current lead nurturing strategy. But the ultimate goal is to provide marketers and founders with some core principles on the topics of lead nurturing, and lead scoring. My intention isn’t to provide a cookie cutter solution, but instead to stimulate ideas and encourage a new way of thinking around these topics. 1. Why write another guide on lead nurturing, scoring and drip emails when so much has already been written by others? Most of the materials online on this topic are either too basic or overcomplicated. And even if you find a great source, such as Marketo’s Definitive Guide to Lead Scoring, there are still some important gaps that need to be filled. In this article I attempt to contribute to the overall conversation on lead nurturing, lead scoring, and drip email campaigns. 2. Why is this article so long? And why are you combining Lead Nurturing, Lead Scoring, and Drip Emails into one topic? The reason why we are combining Lead Nurturing, Lead Scoring, and Drip Emails into one paper/article is that these topics are all part of a continuous marketing effort to attract, engage and convert customers. Lead nurturing is your communication process. Lead scoring is your strategy for prioritization. And drip email campaigns are one of the most effective ways to talk to your customers — for now at least. (Maybe chatbots will change this but for now email is still one of the most effective communications channels). 3. Why is this article missing a case study? While I have tried to add examples from real companies, my initial intention was to include a more detailed case study to this article. But since this piece is already long, I decided to leave a detailed case for another post, and focus here on the bigger picture. 1.1. What is nurturing? : lead nurturing, and customer nurturing? Before we jump into describing lead nurturing, let’s start by defining the term ‘nurturing’ as it is used in marketing. Let’s make it clear that I’m not attempting to introduce a new term for the sake of it here. New terminology can come across as noise when it’s simply about adding another meaningless term. However, in my view, using consistent and clear definitions helps bring clarity to marketing, sales, and customer success departments. - care for and encourage the growth or development of. - to support and encourage, as during the period of training or development; foster. Nurturing (as a marketing term) is a process of continual communication with a company’s target audience across all stages of the customer lifecycle. Lead nurturing is therefore a process of continual communication (or interaction) with a prospect that improves a company’s chances of converting that prospect into a customer at some time in the future. Lead nurturing is communication that happens between ‘Visitor’ and ‘Customer’ stages in the customer lifecycle funnel. Marketing teams are responsible for managing lead nurturing. Moving on from this communication process that we’ve called lead nurturing, comes customer nurturing (or Customer Success). 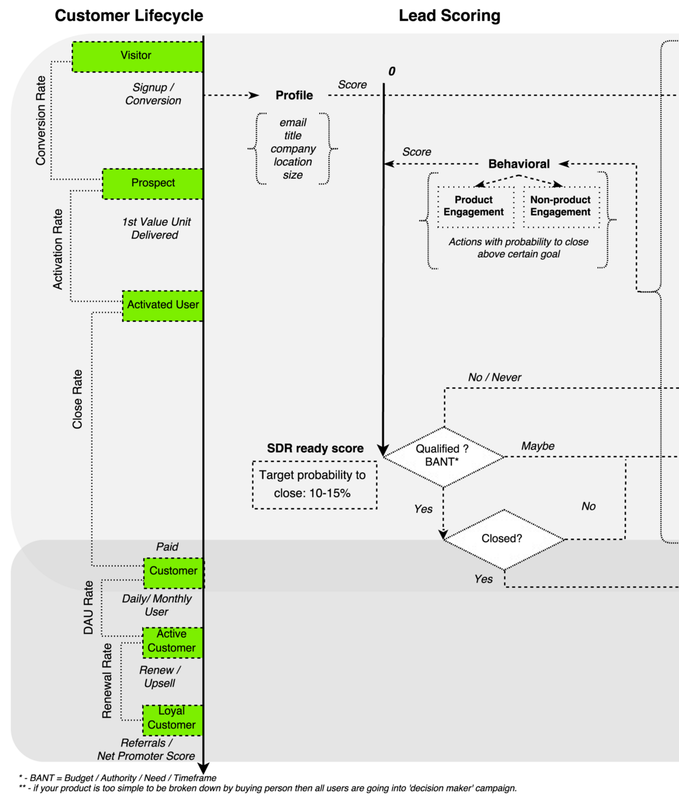 This part of the process refers to the communication that happens after someone becomes a ‘Customer’, in order to move them along to the ‘Loyal Customer’ stage. Customer success teams are in-charge of customer nurturing. Customer nurturing should be a never ending process of communicating with your customers. LEARN MORE: Customer nurturing is critical to reduce churn. If churn is a concern for your business and you want to learn more about differentiating lead nurturing and customer nurturing, and why customer nurturing is an essential part of success in SaaS businesses, I’d recommend you read this article by David Skok on churn rate: Why Churn Is Critical In SaaS. 1.2. Why is a nurturing strategy essential for growth? When we use or hear the term nurturing, everyone in the organization should understand that we are talking about communication with customers and prospects across all stages of the customer lifecycle. Every interaction with a target audience is nurturing. In this context, lead/prospect nurturing, and customer nurturing become self-evident terms. Nurturing, like many other things in marketing, is not a new concept. One of the best examples of nurturing is a story of the greatest car salesman in the World — Joe Girard. Joe employed two assistants to work on his secret weapon that helped him sell over 13,000 vehicles over 15 years (between 1963–78). What was Joe’s secret weapon? Greeting cards. Yes, he and his assistants sent over 13,000 greeting cards per month. Way back in the 1960’s and 70’s Joe wasn’t just nurturing leads, he was also sending cards to customers, so he was nurturing customers too. He realized that the best way to build loyalty and increase referrals was to have continual communication with his target audience. In his case, the target audience was segmented primarily based on location. He wanted to target people in proximity to the dealership he worked at. Since social media and email weren’t an option, greeting cards did enough to keep him at the forefront of people’s minds and associate the car buying experience with Joe himself. Essentially, Joe created a simple, but very effective nurturing process that included both lead, and customer nurturing. Granted, SaaS/enterprise software company sales processes are somewhat different from car selling but we still interact with human beings, so it can be argued that the concept of nurturing has not changed since the 1960’s when Joe started his greeting card campaign (I’m by no means implying that Joe invented “nurturing”). ASIDE: I would like to point out that measuring and attributing exact sales numbers to the success of a greeting card campaign is extremely difficult. Was Joe calculating ROI on each greeting card? Was he able to say exactly how many sales came from his greetings cards? Can he attribute whether it was the last greeting card or the first one that brought customer into the dealership? I highly doubt he had a clear answer to any of these questions, but he had a feeling that this nurturing campaign was working. Of course, he could ask customers why they came to him and to his dealership, but how often would customers misjudge the fact that Joe was probably the only car salesman in the area that they could remember by name? Hopefully, it is clear by now that defining nurturing as 3 standalone terms brings more clarity and order to an organization’s marketing activities. Another reason why nurturing is an important term to define and use is because it changes organizational perspective from just lead nurturing — what marketing teams are doing to help sales close deals — and customer nurturing — what customer success teams are doing to create loyal customers; to become a notion of creating broader nurturing campaigns to target audiences across all stages of the customer lifecycle. Examples of such broad nurturing campaigns are sending birthday greeting cards, hosting community events, and surveying target audiences to identify industry trends. All of these are nurturing campaigns that target your audience across any stage of the customer lifecycle. Now let’s zoom in on lead scoring. Lead scoring is a process of assigning scores to prospects based on their profile and behavioral data in order to prioritize leads, improve close rates, and decrease buying cycles. If lead nurturing is a process of continual communication (or interaction) with a prospect that improves a company’s chances of converting a prospect to a customer at some time in the future, then it makes sense to combine this with lead scoring. Lead scoring helps prioritize leads for sales teams, and enables you to evaluate the effectiveness and efficiency of your nurturing campaigns. The structure and strategy for lead nurturing and lead scoring depends on a company’s growth stage. Lead scoring isn’t equally important for every stage of the company’s development (bear in mind that while this high level strategy can be applicable in many markets, we are focusing on SaaS/enterprise companies in this discussion). Early Stage: seeking product-market fit. Growth Stage: expanding markets, growing demand, and scaling processes. Maturity Stage: focusing on optimization and efficiency. For companies in the early stage of seeking product-market fit, lead scoring isn’t usually a top priority. If you generate just a few leads daily and you have capacity to follow up on each and every lead, the importance of prioritization is greatly reduced. However, even at early stage, it is highly recommended to implement some very basic lead and user tracking system. By doing this, you can collect valuable information on what journeys your prospects take before they buy. This means that when your company moves to the growth stage you have a few months/years of data ready to optimize your lead scoring. At the beginning, you can just ensure that you track as many user actions inside the product as possible. This will enable you to run statistical correlation analysis on what action or patterns of user interaction with your company lead to higher close rates. Starting with a few months of product usage data will mean that your team doesn’t have to make wild guesses when starting lead scoring. Often lead scoring is fully implemented and tested at growth stage. A company starts to grow and generate higher inbound demand, and at this point the goal is to identify prospects that have an urgent pain from those that perhaps need to be educated on problems and solutions; in other words, need to be nurtured. Lead scoring at this stage becomes critical to ensure that as the company scales, it is doing so using its resources most optimally. Lead nurturing in a growing company can evolve from default communication with their audience to a more segmented and targeted approach, such as designing drip emails for each role in the buying process, or for each specific vertical. At this stage, communication becomes much more precise in lead nurturing campaigns. For example, in an early stage company, when a prospect signs up, the company might have one drip email campaign for everyone. At growth stage, the same company may have a few drip email campaigns: one targeted to decision makers, one towards influencers, one communicating a specific value proposition for a financial institution, and so on. The goal is to divide your communications into meaningful segments based on buyer’s roles, verticals, or specific pains. Mature companies should have well-designed, and smoothly working lead nurturing, and lead scoring systems. The primary difference with earlier stages is that a mature company will have more data to conduct robust pattern analysis, and further segment communication with its audience by vertical, by pain, by buyer’s role and so on. Before we discuss different lead scoring systems, let’s remind ourselves about the goal of lead scoring. The goal of lead scoring is to help a company prioritize leads, improve close rates, and decrease the sales cycle. Lead scoring is a primary strategy to improve the productivity of your sales organization by prioritizing prospects with higher potential Customer Lifetime Value (CLV). Prioritization allows companies to use resources more effectively, meaning that salespeople are spending most of their time with prospects that are closer to a buying decision. 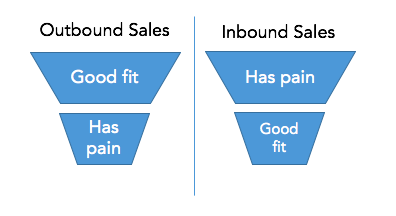 In his book “The Sales Acceleration Formula”, Mark Roberge points out that leads, both inbound and outbound, can be analyzed from the perspectives of fit and pain. The difference between outbound sales and inbound sales approaches is that the first follows the pattern of finding a good fit and then identifying pain, where an inbound sales approach attracts leads that have a certain pain and then qualifies whether or not these leads are a good fit for the company. The higher the number of inbound leads, the more significant lead scoring and prioritization becomes. Otherwise, your team will run the risk of spending time with leads that aren’t as valuable, or missing out on really great opportunities that are buried in a pile of not very valuable leads. Does this prospect experience the pain that our product solves? How big is this pain relative to other pains and challenges that this prospect faces daily? Is this prospect a good fit for us? Does he/she have the budget to pay for our product? Does he/she have enough resource to implement our product? The level (concept) of FIT and PAIN is what drives lead scoring. Lead score shows how well a prospect FITs your ideal customer profile, and how much PAIN the prospect has based on behavioral data. TAKEAWAYS: First, if you are serious about significantly increasing the productivity of your sales team by putting a successful lead scoring strategy in place, now is the time to make sure you fully understand how FIT and PAIN influence your inbound and outbound actions. Second, you need to make sure you have a system in place for assessing FIT and PAIN. The most common way to set up a lead scoring system is to use numerical values to assign a score to each lead and then categorize leads into 3–4 lead buckets according to their score. The problem with this approach is that while everyone understands that leads in A category are SDR-ready, there is a little agreement in how conceptually (not only numerically) leads in categories B, C, and D are different. Except from the fact that they still aren’t SDR-ready. Grasping the difference between C and D leads, for example, can cause a great deal of confusion in marketing and sales teams. In The Definitive Guide to Lead Scoring, Marketo’s team recommends creating separate scores for behavioral and profile metrics and then merging these scores into a table to see where each lead falls in prioritization. LEARN MORE: You can read more about this lead scoring system in The Definitive Guide to Lead Scoring by Marketo’s team. While this guide provides some helpful information, it overly complicates lead scoring implementation by suggesting that companies need to track vanity metrics such as open emails, clicks on the links in them, and broad web page visits. Also, breaking lead scoring into A, B, C, D categories doesn’t provide much benefit for teams, as I will try to explain below. In my view, this approach to lead scoring brings unnecessary complexity. The goal of lead scoring is prioritization. So instead of complicating lead scoring by creating artificial lead categories, why not just use a numeric score to identify how close a lead is to an SDR-ready score? And how ‘hot’, or close the lead is to SDR-ready score is best represented by a numerical value. There is almost no practical value in breaking down two lead statuses (SDR-ready and not SDR-ready) into four categories (A, B, C, D), or worse yet using more subjective labels (‘hot’, ‘warm’, ‘cold’). A counter argument is that breaking down leads into A, B, C, D categories helps companies analyze how prospects progress towards their target score. However, finding and testing optimal SDR-ready scores is difficult enough already. Creating and testing score ranges for each category rarely has any meaningful ROI attached to it. Quite often companies end up with large variations of leads in each category that don’t really show problems in lead nurturing, but are rather the result of lead score ranges being far from optimal. To simplify, let’s remind ourselves that the goal of lead scoring is to prioritize leads and improve how a company nurtures leads over time. 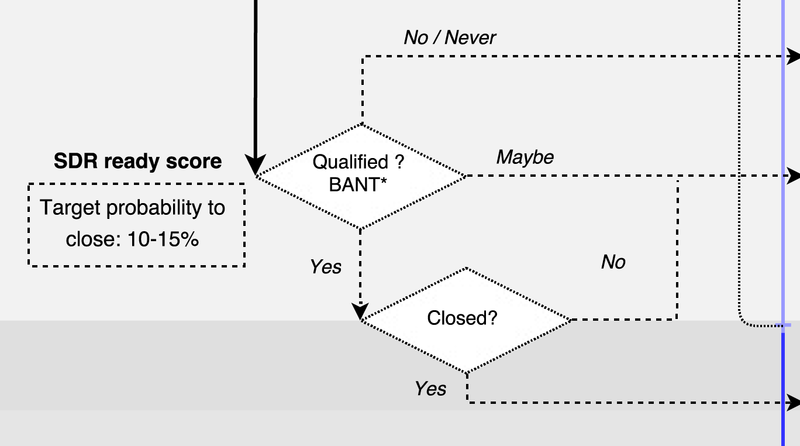 Progressive scoring means that leads can be scored between 0 and ∞, with one target (SDR-ready) score somewhere on this continuum, that when reached, moves the lead to SDR qualification stage. 2.4. What is a target (or SDR-ready) score and how do you select one? A target (or SDR-ready) score is a score that shows that a lead has reached a certain level of FIT and PAIN that qualifies that lead to be passed to the SDR team for further qualification. If you are just starting out with lead scoring you will have to analyze what pattern of actions prospects are taking that lead customers to buy your product. Ideally, your target lead score has to be correlated with 10%-15% close rates. What this means is that 10%-15% of the leads that reach the SDR team have to close in the duration of your average sales cycle. The best way to get the most from this process is to test and optimize your SDR-ready score for more efficiency. If your SDR team has sufficient resources, you can experiment by lowering your SDR-ready score to 8%-10% probability-to-close to test whether your sales team can close more deals by starting interaction with prospects earlier in the buying process. On the other hand, if your SDR team can’t effectively follow up with every lead that has reached an SDR-ready score within 48 hours, you might want to increase your SDR-ready score to correspond with a 15%-20% probability-to-close. This relationship between target (SDR-ready) score and probability-to-close is important. If leads that reach your SDR team have a probability-to-close below 10% in the average sales cycle, the chances are that your SDR team is wasting their time; those leads weren’t nurtured enough. On the other hand, if your SDR-ready leads are closing with much higher probability, for example 20%, then you might be leaving money on the table and not growing as fast as you could. In this instance, one solution would be to hire another SDR. Target (or SDR-ready) scores will be unique to every company. I doubt any company can get it right from the start. Like many other important things, getting it right is all about continuous optimization and testing. ASIDE: Recently, I came across an interesting method of scoring leads used by the Engagio team. Engagio seems to have a system of assigning value to their prospects not based on the clicks in the email (by the way I believe no actions in the email should be scored) but based on the time prospects spend reading the email, watching the video, or on the website. This is an interesting concept to try, but I haven’t seen any company implement this model well, so it’s hard to make any valid analysis. One reason for my caution is that we can’t always assume that higher time spent in product leads to higher perceived value. For example, if a Facebook user spends more time on the platform, it’s very likely that he/she derives higher value from it. But what if your product delivers value on the fact that customers need to spend less time using the product in order to achieve their desired outcome? In order to put this into context, let me share a real world example. I was buying a CA fishing license on one of those .gov websites recently and it took me 20 minutes to do so. Was my time spent on the website correlated with desired value? No! Quite the opposite. I wish I had achieved my desired outcome in 30 seconds or less. 2.2. What are the factors that drive lead scoring? Profile (or demographics) data is more static and gets scored early in the process when prospects enter (or sign up to) your marketing automation or CRM. Is this a personal or corporate email? Corporate emails should be scored higher since they usually mean that the prospect is okay with communication at a corporate level. Even if you don’t currently ask for title, for example if you just ask for email, you should consider a data enrichment solution to help you identify the title of a prospect. Obviously, if the prospect is a manager, VP, or C-level, a higher level of attention should be given to this prospect and a higher score should be assigned. Title is not just for you to assign a higher score, it will also help you to identify the role of the person in the buying process. If your product is more technical and more expensive it is very likely that a few people in the organization will be involved in the buying process. They can have different needs and different agendas, so it is highly recommended to structure your Drip Email Campaigns for each participant in the buying process: decision maker, influencer, and end-user. But I’ll talk about this more later. The reason why it is helpful to know the exact name of the company is that you can check whether the company is on your target list, and if so, you can assign a higher score. By target list I’m referring to account-based sales strategies. If a prospect that you are targeting in your outbound campaign came through your inbound channel and registered, it is very likely that they were exposed to your message in outbound communication. Location matters, simply because not many companies are selling to customers all across the World, and even if they do, not every market has the same profit potential. This is true for countries, for example US vs. Eastern Europe, as well as states, for example California vs. Mississippi (I have nothing against Mississippi, I’m just making a point). The size of the prospect’s company is helpful in estimating their potential revenue or buying power. On the other hand, if you are selling your product for sales people on a per seat basis, then you could also look into more specific numbers, like the number of salespeople in the organization. SaaS/enterprise companies can use a data enrichment solution to help create a full picture of incoming prospects and score these prospects accordingly. For example, Outreach, a sales communication platform focusing on outbound, sells its solution to sales reps. The size of sales organization is crucial in estimating potential customer’s LTV. In this case it makes more sense to ask about the size of a prospect’s sales team than the size of the company overall. Profile data is easy to find and create rules and scoring around. With behavioral data things are far more challenging. First of all, there are many more behavioral factors to consider than profile factors. Second, profile data is more static and only gets scored once at signup stage; behavioral data is more dynamic and requires constant monitoring and regular checkups. While SaaS companies can use a data enrichment solution to help create a full picture of incoming prospects and score their profile characteristics accordingly, no such 3rd party solution is available for your team to analyze what behavioral factors need to be scored. There are some good products that can help you track how users interact with your product, but only your team can make a connection between product and company interaction and closed deals. No single 3rd-party product will have the connection between product usage data and closed deals. 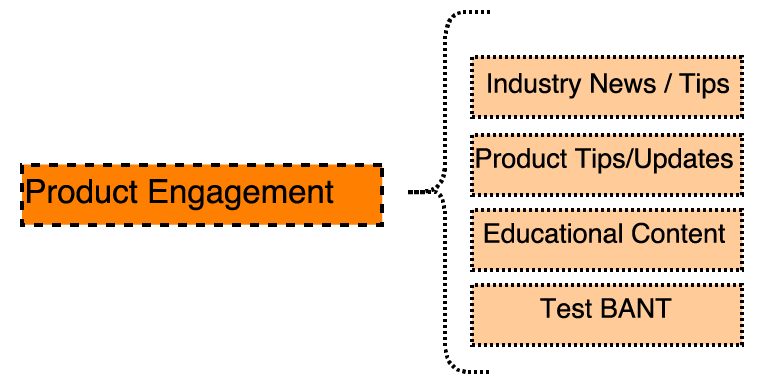 Product engagement actions are actions that prospects perform inside of your product. This is by far the most important category compared to non-product engagement. 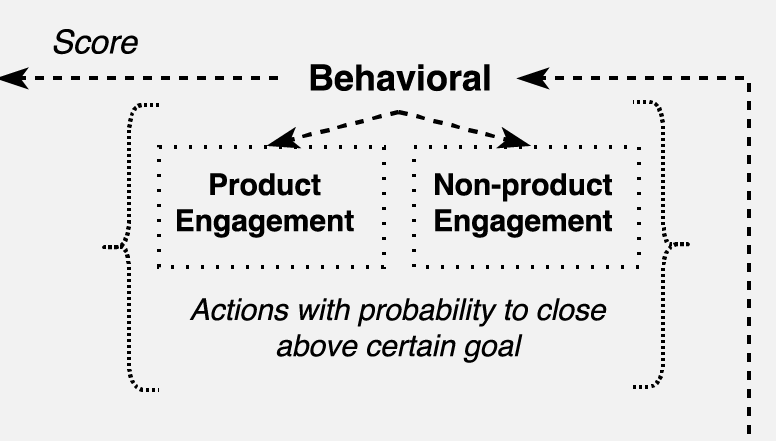 It is almost always true that when behavioral data is correlated with closed deals, product engagement/usage data has a higher impact on probability-to-close compared to non-product related interactions. User returns to your product. User completes core action in the product (eg: creates proposals, signs proposals). Downloading a whitepaper or industry research. Visiting your pricing information, FAQs, or documentation pages. One temptation to avoid is giving a score for very trivial actions like visiting your website, opening drip emails, clicking on links in emails and so on. These actions require very little time investment from prospects and are more often than not, driven by curiosity. The higher the PAIN (or interest), the higher the time investment a prospect is willing to make. When it comes to drip email campaigns, the primary goal for the drip email is to bring a prospect back to your product and entice him/her to take an action. As we discussed in the previous section, lead scoring becomes more important when a company has already figured out product-market fit and is ready to find a scalable process to reach its target audience. However, tracking customer interactions and engagement early can pay handsomely in the future. When you finally decide to implement lead scoring and decide which score needs to be assigned to which engagement/action you will have some data on which to conduct correlation and regression analysis. The speed with which leads are re-scored is critical for timely and targeted outreach from your sales reps.
For example, at RapidMiner lead scoring happens overnight so that the next morning sales reps can reach out and offer targeted resources like documentation, tutorials or webinars based on something that user has done in the product. For RapidMiner the short term goal is to get this overnight re-scoring process down to an hour. What if you have enough data for machine learning using correlation and regression analysis? Correlation and regression analysis are the two most popular techniques that will help you identify engagements and actions that lead to a higher probability of your prospect becoming a customer. Once you have this data, you can create a list of actions/engagements from highest to lowest probability-to-close. Out of this list you can pick actions/engagements that increase probability for any prospect to become a customer. Most accurate and targeted profile data can lead to an SDR-ready score with no or limited behavioral score. For example, if you are selling a SaaS product for HR and a VP of HR at Salesforce signed up for a trial but hasn’t done anything inside of the product, you want to follow up with this prospect as soon as possible based on potential customer LTV, and your lead score should reflect this. But tune this approach in the way that only about ~5% of all leads scored on profile data only automatically hit a SDR-ready score. The prospect has to be a 100% match from a profile perspective, and I would suggest giving a score if this prospect is also from a company/account that you are targeting in your outbound sales. ASIDE: I strongly believe that email engagements should not add to the score but drive to product where score can be improved with increased engagement. Put together a list of actions that you record in your product and website along with profile data. Conduct simple correlation analysis to identify what factors impact deal-closing the most. After correlation analysis, you should have a list of actions with corresponding probability. This is the easiest way is to turn probability percentages to numerical scores. For example, when your prospect creates a doc in your app, it increases probability to close by 25%. So, just assign 25 lead scoring points to every prospect who completed this action. Prospect A has signed up for your product free trial. This prospect received a high profile lead score. But besides getting to the product dashboard, the prospect has not engaged with your product. The next time this prospect returned to your product was 2 weeks later, and while engaged with the product he/she reached an SDR-ready score. Prospect B on the other hand not only signed up to your free trial but also completed onboarding and became an ‘active user’ by completing actions that lead to delivery of the 1st unit of value (often described as the ‘Aha’ moment). Both, Prospect A and Prospect B reached SDR-ready scores, but with one significant difference. Prospect B has completed the path from 0 to SDR-ready in one day and for Prospect A this took 2 weeks. Prospect B had a higher velocity and this usually indicates that this type of lead is experiencing higher pain and more interest in a product. This lead therefore requires, and justifies a more immediate response from your SDR team. LEARN MORE: please do not confuse lead scoring velocity with what Jason Lemkin calls Lead Velocity rates: Why Lead Velocity Rate (LVR) Is The Most Important Metric in SaaS. Higher velocity leads to a higher score. There is tons of information written on the first touch vs last touch attribution. But let’s take a minute to share a quick reminder about what attribution is. Attribution is the process of identifying a set of actions by a user/prospect that impacts desired outcome. In our particular example of lead nurturing, we can use the desired outcome of becoming SDR-ready or converting to a paid customer. While we as marketers worry about how to attribute first and last touch, we forget that pattern is the most important aspect that needs to be analyzed when it comes to uncovering conclusions about how customers buy. As an ex-athlete, I will give you a track and field analogy to illustrate my point. What has more impact on an athlete becoming an Olympic champion? Is it his or her first practice or the last? You could argue that people get into sports through inspiration, ie. the first race argument, or you may say that you can’t win the Olympics by skipping the last warm up before the race. While both these arguments have truths, it is the practice patterns over a long period of time that correlate most with successful performance. The same is true for Joe Girard’s greeting card campaign I highlighted earlier. It is a regular pattern that leads to success, rather than the first or last card received by his customers and prospects. What happens when your target lead score is reached? When a prospect reaches an SDR-ready score, your SDR team needs to follow up with this prospect in a timely manner. Having a rule in place around how quickly your SDR team has to follow up can make this process more efficient. For example, you may put in place a rule that says that your SDR team has to follow up in the first 48 hours after a prospect has reached an SDR-ready score. ASIDE: Companies often employ rules around how leads are assigned within the SDR team. For example, one of the more common methods is to assign leads randomly. Occasionally, companies have their sales team structured based on vertical markets, geography, or size of the prospect’s company (SMBs — small businesses vs. large enterprises). So it makes sense to consider these factors when directing SDR-ready leads. If your prospect is qualified by SDR, then it is passed to an Account Executive (AE) to carry out your sales process. If a qualified prospect becomes a paying customer then this account moves from lead nurturing to customer nurturing stage. At this point your customer onboarding drip email campaign should be activated to ensure a successful onboarding process. If a qualified prospect does not become a paying customer then that prospect should be added to your product engagement drip campaign. They might become a paying customer in the future. So don’t completely abandon prospects that were disqualified by SDR just because they aren’t buying right now; keep talking to them and nurturing them. If a prospect falls under bad FIT / high PAIN or good FIT / low PAIN, then that prospect should be put into a ‘Maybe’ category and assigned a drip email campaign that addresses current objectives. For example; if the prospect is not ready to buy now, or the company does not experience high need, but is growing quickly and may change, or maybe they are in the middle of hiring a decision maker responsible for addressing this issue? If a prospect reaches SDR-ready score and your SDR team qualifies it as low PAIN and bad FIT, then that prospect should be moved to your No (never) bucket. You should still send them appropriate drip emails and score them, but it’s very unlikely that they will ever convert. Or possibly they will pay for the product without any sales-touch? Keeping talking to your prospects even though they fall under your ‘never’ category of prospects, gives them an opportunity to convert themselves at some point in the future. Why do bad FIT + low PAIN leads reach a SDR-ready score? It’s very possible that a small startup, competitor, student or a VC is doing research and while doing so reached SDR-ready score. This should happen only once in awhile, otherwise you might have deeper issues with your lead scoring system than you realize. If this happens to more than 5% of leads, you should adjust your lead scoring. ASIDE: Today buying processes are less linear and more dynamic; there is not just one path for the customer to get familiar with your product. While for the most part we are talking in this article about individual leads, we all know that there are multiple people in the company who are taking part in product evaluation. Therefore, lead nurturing and lead scoring should take this into account. Account-based selling and marketing is a relatively new term describing something that companies have been doing for a while, which is optimizing selling efforts for the whole company (account). How account-based approaches impact lead nurturing and lead scoring is a larger topic that needs to be covered separately. But one of the strategies that companies can consider is rolling up individual lead scores for a particular account into one account-based lead score. For the most part in this article we’ve talked about static lead scoring. By static, I mean that statistical analysis is done as a one-off and lead score is assigned based on the results. But we are living in a dynamic world where things change rapidly, and with an increasing volume of leads, this static approach limits accuracy. This is where predictable lead scoring can be extremely helpful. When your company receives thousands of leads and there are growing number of factors that impact a lead’s probability to close, predictable lead scoring can adjust lead scoring in real-time as soon as your prospect interacts with your product. 2.5. What are the biggest mistakes when it comes to lead scoring? As a founder or Head of Marketing at an early stage company, you need to plan ahead and realize that even if your lead volume is extremely low now, tracking how customers use your product will help you conduct more accurate correlation and regression analyses to come up with more accurate lead scores later. You are not going to build a perfect lead scoring strategy from the start. So the best approach is to start simple and consistently adjust your score strategy: add new engagement metrics that show high correlation and remove scores that are too low. And let’s all agree to drop using A, B, C, D categories — it complicates processes and brings unnecessary confusion to the teams. There is very little value in spending time arguing whether a lead belongs to category D or C.
If your team is using a static approach (one-off) to lead scoring, then scoring over 20–25 engagement factors is over complicated and it is time to review your lead scoring strategy. Try to reduce your list of scored engagements to 15–20. One of the best ways to do this is to select a cut-off probability-to-close below which engagement won’t contribute to overall lead score. For example, if adding a picture to your document (I’m using Pandadoc as an example here) only increases chances for this lead to close by less than 5%, remove this action from your scoring list. Your team will be better off not scoring it at all. However, as we discussed in the previous section, with predictive lead scoring your team can run automated statistical analysis more often and you can expand the list of actions and engagements you score. Most organizations overweight factors based on personal experience and intuition. In order to implement effective lead scoring, teams need to employ at least some basic statistical analysis. A drip email campaign is a set of automated emails that are triggered either by action or time intervals. Drip email campaigns are a primary nurturing/communication channel with your prospects and customers. The goal of drip email campaigns is to constantly/consistently re-engage your audience with your product. We are all familiar with drip emails, but it is important to understand how drip emails impact on lead nurturing and lead scoring. In addition, you need to be familiar with how segmentation helps improve the performance of drip email campaigns. A quick example of a drip email campaign is a series of emails that prospects receive over the first week or two after signing up for a free trial. This welcome drip email campaign is without a doubt the most important campaign because it is the first interaction that a prospect has with your company. ASIDE: Drip email campaigns are a set of emails. A drip email is a single email that can be either part of a campaign or a standalone email with a specific purpose. Transaction-based drip email campaigns are emails that trigger action, often with the purpose of confirming or verifying a transaction or identity. A few examples include: email verifications, forgotten password emails, purchase confirmations and so on. The more often we experience something, the less effect it has. 3.1. What are the primary categories of drip email campaigns? A drip email campaign is a primary nurturing/communication channel with your prospects and customers. 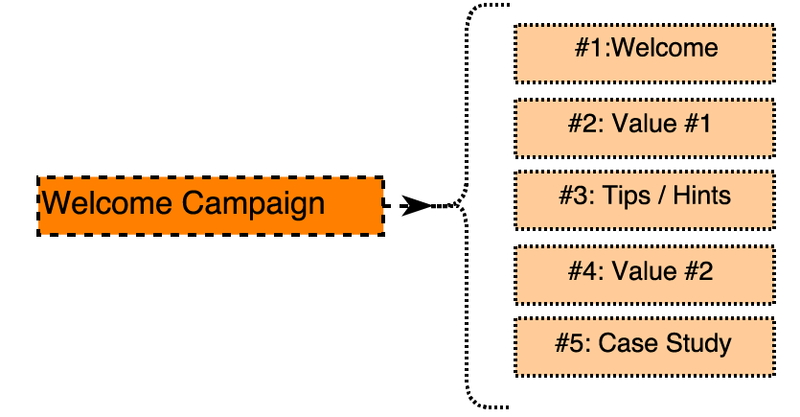 Let’s look into how most common drip email campaigns are structured. This is not in any way intended as a comprehensive list and you should consider your product and user acquisition process to identify and design the best performing drip email strategy for your business. Goal: to complete the signup process and provide a guide to first value delivered to a prospect. Since the goal of a welcome email campaign is to deliver the first unit of value (aka the ‘Aha’ moment), you can stop this series of emails at any time when user becomes an ‘active user’. At this point, prospects understand your product value proposition and the next step is to teach them how to get maximum value from your product. Goal: to encourage prospect to complete user onboarding process, improve his or her profile and guide prospects through the steps required to receive first unit of value from using your product. If a welcome drip campaign is concerned with answering why the user should consider using the product, then an onboarding campaign should guide the user on how to get maximum value out of the product by providing more profile information and/or finishing certain user flows. For example, if a user submits a registration form to create an account on LinkedIn, he/she will receive a welcome email. If the user never comes back, he/she will receive a series of welcome emails to encourage them to come back. On the other hand, if a prospect has registered to LinkedIn and started using it but hasn’t completed their profile details, then LinkedIn’s user onboarding emails will be sent. These explain why and how providing more profile information can enrich a user’s LinkedIn experience. Goal: to nurture prospects into reaching an SDR-ready score or into signing up for a trial. 2) getting the customer to an SDR-ready lead score. If a prospect was disqualified by SDR, then you can pass this lead back to your nurturing campaign if you don’t have another drip email designed specifically for this scenario. Goal: to get prospects back to the product and engage them in the product. Product engagement campaigns are essential to a SaaS company with a freemium business model. Companies that use freemium models need to ensure that customers who aren’t paying for the product right now are engaged and increasingly use the product. Goal: to fully set up the customer’s team with your product. Customer onboarding emails should guide your customer through your onboarding process. Does your product need to be integrated with a third party tool in order to provide maximum value? If your product is more technical and higher priced, then your customer onboarding process will more than likely require a personal touch by your customer success team and implementation sales engineer. In this case, automated customer onboarding emails can be used to help you set up a kick-off meeting with customer success, educate your customers on onboarding expectations or invite new customers to a weekly product training webinar. On the other hand, if your product is simpler and costs less, your customer onboarding emails should automate as much of the onboarding process as possible. Your team needs to identify the critical steps in the onboarding process and guide prospects through them in a more automated, cost effective way. Goal: to notify and update customers on usage limits and new features, with the purpose of upselling. Upsell drip campaigns can be used to inform your customers about new features and new releases, or to notify usage limits and entice the customer into seeing how, with an upsell, more value can be received from your product. Goal: to alert the customer about upcoming renewal. Renewal drip campaigns should remind customers to renew annual subscriptions. While your customer success team is responsible for renewals, automating some of the communication can prevent renewals from falling through the cracks. It is worth mentioning that transactional drip email campaigns are also part of your communication arsenal. Transaction emails help your users to verify emails, to reset passwords, to receive invoices or receipts and so on. Drip email campaigns are an essential part of lead nurturing and are an important communication channel. Customer lifecycle should be analyzed carefully when deciding how and when to send drip campaigns. Besides the different drip email campaign categories discussed above, I want to highlight the importance of segmentation. If you’ve read this article to this point you might be starting to think that lead scoring and drip email campaigns are very complicated and difficult to implement. But this needn’t be the case. Neither is done over a short period of time. Drip emails and lead scoring evolve from the early stage of your company and might start off as just a couple of welcome email communications, moving on to a broader and more segmented communication process when your company enters growth stage and then moves to maturity. The real goal for segmenting drip campaigns is to get better prospect engagement with a product that will lead to an increased lead score and eventually lead a prospect to buy your product. In some cases, companies invest a ton of time in deeply segmented nurturing only to find out that the audience is too small or, more often, the segmented campaign performs only slightly better than a generic one, and thus ROI isn’t there. Marketing teams should understand the relationship between effort and potential upside when creating segmented drip email campaigns. One way to address the issue of potentially low ROI in segmentation is starting small and tracking how segmentation impacts engagement metrics. Do your prospects have higher CTR in segmented campaigns compared to generic ones? Do these email engagements lead to higher product engagement? Remember I suggested that you do not assign a score to leads solely based on email interaction. However, tracking CTR and open rates is an important piece of the puzzle when you want to understand whether segmentation performs better than generic campaigns. Segmentation is a continuous process and it’s important to avoid investing tons of time on very deep segmentation campaigns early on. But what if it makes sense to test segmentation because you know there are different types of customers with different pains that need to be addressed; how do you start segmenting drip campaigns? Segmentation of your prospects can be done based on their role in the buying cycle if you are selling more complicated products that involve multiple people in the buying process. Another effective way to segment your prospects is based on vertical markets. You can address the target audience in each vertical with a very targeted message, value proposition and case studies. So when prospects sign up for a free trial, you can identify his/her vertical and fine-tune your message accordingly. Early stage companies can have just one simple (default) drip email campaign that communicates the same message to every prospect. If your product is more technical and there are multiple buyer personas involved in the decision making, you can expand your drip email campaign by segmenting your default campaign with more specific messages to other parties involved in the process. Of course, if you have a simple product, and by a simple product, I mean a product that only targets one decision maker (end-user), it doesn’t make sense to segment drip email campaigns based on buyer personas. At the growth stage, when your company wants to expand markets and build scalable processes, you can further segment drip email campaigns based on vertical markets. And finally, mature companies. They know their markets very well and by this stage in their development, have designed and tested drip email campaigns that are highly segmented, based on buyer’s personal data, verticals, product offerings, geographical location and so on. TAKEAWAYS: The key thing to remember about drip email campaigns is that their main purpose is to deepen audience engagement with your product. In order to achieve this, it makes sense to segment your campaigns by buyer persona, vertical and purpose so that your message is appropriate and valuable. And finally, don’t forget, that ‘less is more’ when it comes to quantity. Nurturing is a process of continual communication that includes both lead/prospect nurturing, and customer nurturing. The goal of lead scoring is to prioritize sales resources, improve close rates, and decrease sales cycle. The best approach to lead scoring, as well as its importance changes for companies depending on what stage of growth the company is at. Lead scoring is essentially a quantitative analysis of FIT and PAIN based on prospects’ profiles and behavioral data. Lead scoring systems should be simple but effective. The biggest mistakes when creating a lead scoring strategy are: not tracking user behavior early enough, overcomplicating lead scoring with categories, and scoring way too many irrelevant behavioral factors. Drip email campaigns help companies consistently re-engage their audience with their product. Gradually segmenting your drip email campaigns can increase prospects’ engagement with your product. Tracking performance of your drip email campaigns can prevent you from spending too much effort on segmentation for a pool of prospects that isn’t large enough or designing drip email campaigns that perform only slightly better than generic ones. Vik Kuushynau, Head of Product Marketing at PandaDoc, for brainstorming with me during the time I was creating an outline for this article. Tom Wentworth, CMO at RapidMiner (previously CMO of Acquia), who provided early and critical feedback. Especially, he reminded me that scoring behavioral factors in lead scoring strategy can be more easily understood when they are broken down by product behaviors and non-product behaviours. Also, Tom highlighted that predictive scoring is what’s changing the marketing landscape these days. Zorian Rotenberg, CEO & Founder of Atiim and sales leader veteran, for pointing out that my customer acquisition framework is missing the idea that the opportunity stage itself should include 3–7 stages so that sales organizations understand sales process effectiveness. Since a lead can be in the opportunity stage for a while, companies need to understand what is going on, and how to move forward. An update is coming to the article on how companies track customer acquisitions. Suzie Larcombe, who helps SMEs, startups and scale ups communicate more effectively, for making this article easier to read by cutting chunks of it and fixing all the issues around misspellings, typos, and grammar. 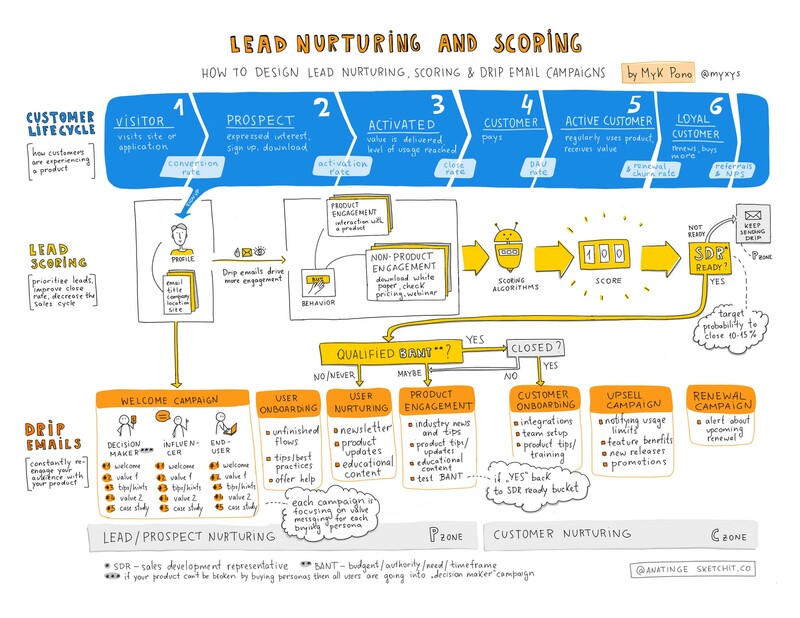 Anna Iurchenko, UX Designer and Sketchnoter, for designing a beautiful sketch to help us visualize lead nurturing, lead scoring, and drip email campaigns. Good overview and explanation of lead scoring principles, but described strategy isn’t optimal. If you are just starting in marketing this is a very helpful guide. I like this doc much better than Marketo’s guide. The Oracle team does a great job describing the most important high level concepts when it comes to lead scoring. Again, Oracle’s team hit the main high-level topics. Amazing overview of basic drip email campaigns. I haven’t found a better resource to start understanding drip campaigns. This article includes great examples as well. Pardot provides a few good ideas on how to structure your drip email campaigns. Follow me on Twitter, Medium, Quora, Instagram, MykPono.com, connect on Linkedin. Join my Telegram channel — Marketing Journal — to discover interesting articles, books, and resources on marketing, product growth, startups, and SaaS.